In their black Mizzou caps and gowns, an apricot tassel, honors cords and master’s hoods, the Sinclair School of Nursing graduates crossed the stage in Jesse Auditorium on Sunday, May 14 to receive their nursing degrees. In all, the Sinclair School of Nursing conferred 180 degrees during its commencement ceremony. Sixty one traditional students received their BSN along with 44 accelerated students, who will complete their program in July. Twenty-two students successfully completed the RN to BSN program. On the graduate level, nine students received their master’s in nursing, 44 completed their doctor in nursing practice degree and four earned their PhD. Judith Fitzgerald Miller, Dean, Sinclair School of Nursing, and Garnett Stokes, PhD, University of Missouri Interim Chancellor and Provost for Academic Affairs, encouraged the students and celebrated with them. Dr. Pam Evans-Smith addressed the students who had had her as a professor in their academic careers. Elise Tadros addressed her fellow BSN students, while Christopher Wilson spoke to his fellow accelerated students and Matthew Walker, his fellow graduate level classmates. As graduation was on Mother’s Day, many of their thanks and praise were directed toward the mothers in the auditorium. 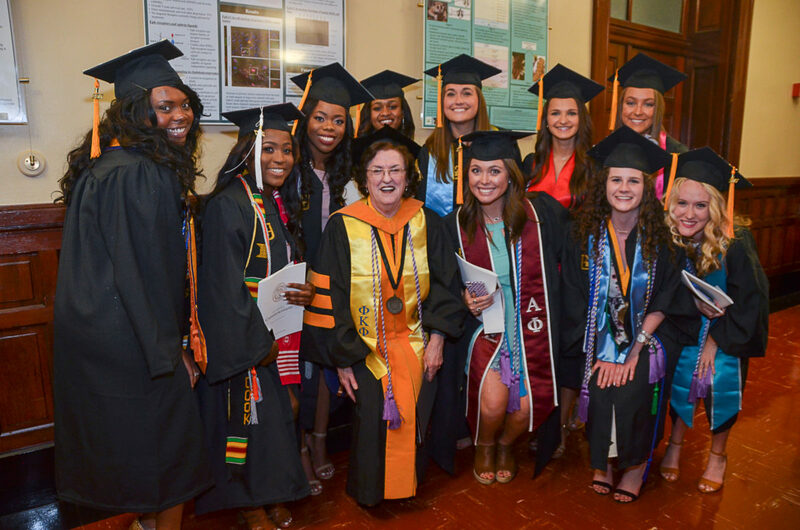 After they walked across the stage toward their diploma, each graduate received an apricot rose from Donna Otto, instructor of nursing and director of alumni relations, who represented the Nursing Alumni Organization. As the new graduates go their separate way and enter the real world, we know they are well prepared to handle the challenges they will face. They are not just nurses, after all, but Mizzou nurses.